There is something very special about her eyes. I wish I could get a better picture, one that captured their beauty and magic. It’s not just me, people have stopped me, commented on her eyes. There is something special about them. I think it’s her brother, her angel shining through those eyes. 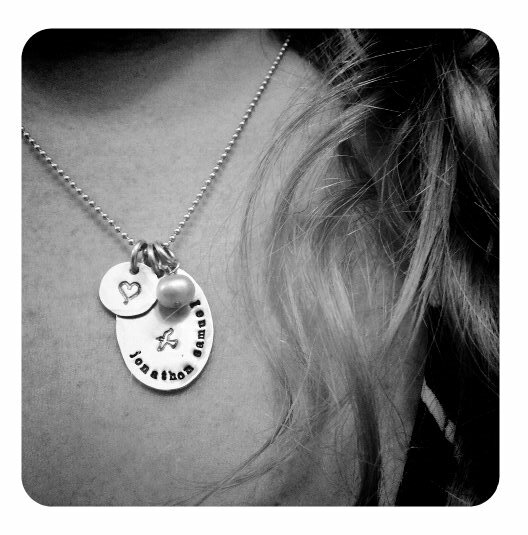 I wore his necklace so he could be with us, part of our family on this special day. It was cold, raining and windy. I kept thinking he was crying because he couldn’t be with us, share in our love and joy, welcome her into Chirist’s family. I didn’t think it would still feel so much like we were missing someone. It was a good day, a really good day. I felt more connected and in love then I have ever felt at previous baptisms. Not to say my other children’s days weren’t special, and loved, they were. There was something different. Part of it is that I am in a much better place at these 13 weeks than I have been at previous 13 weeks, but it was also something else. A feeling of being held, and loved. So loved. It was a really good day, in the end the sun came out and shown on her in her beautiful dress (made from my wedding dress). I took her upstairs and we cuddled and nursed in the waining moments of the sun and despite a lot of chaos going on in her belly and all around us, we were one and we were loved, loved by Him and by an angel that look down and shines through her eyes. Yes today we are loved and it feels like a small (teeny tiny) bit of my broken heart is healing. Healing through water and oil and life. His life. Such a lovely post! Her baptism gown is gorgeous! So happy to hear you are getting to that better place! Praying for you! Oh Melissa, how beautiful! Beautiful words, eyes, the dress. So glad the day was special. I felt this deep in my heart. What a fantastic post Mel. And I'm so very happy that you are starting to feel whole again. I must add that the baptism gown is gorgeous! We had something similar for Anthony. And the water, it does renew doesn't it?! I loved this post, because I'm assured that you are feeling healed by Him, by love, and by holy water. <3 So glad His love enveloped you. So lovely, Melissa. I'm touched and happy for you that this day became so special for so many different reasons. You have been blessed. This is simply beautiful. I have been reading a lot about baptism today to explain some things to a friend and this totally hit home for me. I am so glad that your day was beautiful.